9 While he was still speaking with them, Rachel came with her father’s sheep; for she kept them. 10 Now when Jacob saw Rachel the daughter of Laban his mother’s brother, and the sheep of Laban his mother’s brother, Jacob went up and rolled the stone from the well’s mouth, and watered the flock of Laban his mother’s brother. 11 Then Jacob kissed Rachel, and wept aloud. 12 And Jacob told Rachel that he was her father’s kinsman, and that he was Rebekah’s son; and she ran and told her father. 13 When Laban heard the tidings of Jacob his sister’s son, he ran to meet him, and embraced him and kissed him, and brought him to his house. Jacob told Laban all these things, 14 and Laban said to him, “Surely you are my bone and my flesh!” And he stayed with him a month. 15 Then Laban said to Jacob, “Because you are my kinsman, should you therefore serve me for nothing? Tell me, what shall your wages be?” 16 Now Laban had two daughters; the name of the older was Leah, and the name of the younger was Rachel. 17 Leah’s eyes were weak, but Rachel was beautiful and lovely. 18 Jacob loved Rachel; and he said, “I will serve you seven years for your younger daughter Rachel.” 19 Laban said, “It is better that I give her to you than that I should give her to any other man; stay with me.” 20 So Jacob served seven years for Rachel, and they seemed to him but a few days because of the love he had for her. 21 Then Jacob said to Laban, “Give me my wife that I may go in to her, for my time is completed.” 22 So Laban gathered together all the men of the place, and made a feast. 23 But in the evening he took his daughter Leah and brought her to Jacob; and he went in to her. 24 (Laban gave his maid Zilpah to his daughter Leah to be her maid.) 25 And in the morning, behold, it was Leah; and Jacob said to Laban, “What is this you have done to me? Did I not serve with you for Rachel? Why then have you deceived me?” 26 Laban said, “It is not so done in our country, to give the younger before the first-born. 27 Complete the week of this one, and we will give you the other also in return for serving me another seven years.” 28 Jacob did so, and completed her week; then Laban gave him his daughter Rachel to wife. 29 (Laban gave his maid Bilhah to his daughter Rachel to be her maid.) 30 So Jacob went in to Rachel also, and he loved Rachel more than Leah, and served Laban for another seven years. 39 A wife is bound to her husband as long as he lives. If the husband dies, she is free to be married to whom she wishes, only in the Lord. Taken together, these passages explain that men and women, and parents, can be involved in the choice of spouses. With all of this in mind, I would go further and say that both children and parents should be involved in the process of spouse selection. Unfortunately, nearly all Christian parents today have abdicated this important role. In fact many go so far as to sabotage, through various means, their children when it comes to marriage. Not all mean to do ill, but that doesn’t change the fact that many Christian youth suffer unnecessarily, and risk their souls, because their parents aren’t as involved as they should be. Consequently, I am a major supporter of The Courtship Pledge, run by Scott and Mychael. Scott has asked me to write guest posts there, and I hope to the have first (which will be cross-posted here) up by the end of the week. It will expand on the line of thought started with this post. Saint Ulrich of Augsburg (c. 890 – 4 July 973), sometimes spelled Uodalric or Odalrici, was Bishop of Augsburg and a leader of the Roman Catholic Church in Germany. This brief post is a short collection of some random thoughts that I’ve had lately. Reader input is encouraged. One thing that I have noticed in myself is a tendency to favor “balance” in certain situations. One of the more common ones is when I am writing something critical of women- I instinctively think of something to include which is critical of men in order to balance it out. Having noticed this tendency, I am doing my best to quash it, but it has proven remarkably difficult to suppress. Still, the fact that I know its a problem is probably the biggest step in its correction, because most men don’t even realize that they have this problem. This leads to an interesting point- are most Churchian leaders aware of this particular flaw? I believe it qualifies as a flaw because it often serves to detract or undermine any point they are making. Such leaders are quite prone to this; they will criticize men whenever they criticize women, and they will praise women whenever they praise men. My belief is that some of them know full well what they are doing- they are protecting their interests by not angering the most vocal and involved members of their “flock.” Others, however, I think are so deluded and conditioned that they don’t realize what they are doing. Whether it is a desire to be fair or non-judgmental or whatever, they have made it a habit to seek “balance” whenever women are concerned. Anyone else have this tendency? I will treat you like a Queen… so long as you recognize that I am your King. It is a pet project of mine- a ready-made quip when dealing with a woman I’m investigating for marriage potential who shows signs of being a “princess.” The idea being that I would ask her if she would expect to be treated like a queen when we marry. If she says yes, I would mention this. It could also apply if her parents said something similar as well. So far it doesn’t seem quite perfect, but I haven’t been able to tweak it to that Goldilocks level of “just right.” Perhaps some of my readers would feel like adding their thoughts. Rollo’s most recent post, Controlling Interests, got me thinking about two different things. The first is how brazen many women now are when it comes to living their lives they way they want to. And the second is how a fight is likely brewing between the female “haves” and “have-nots”. The basic strategy which many (most?) women employ right now, which is regularly known as AF/BB (see Rollo’s post for more), is one that requires two distinct elements to pull off: deceit and desperation. Many, if not most, men would not be content to marry a woman whom they realize is choosing to marry them solely as a meal ticket, and effectively a sperm donor as well. It should surprise no one that men don’t like to be used in that way, and will balk at it if they realize that is what is happening. Hence the importance of hiding what is going on from them. What I am uncertain of, and curious about, is what shape this fight will take. Women are already starting to question the dominant paradigm in numerous ways, one example being the delaying of childbirth. Perhaps a similar reaction will take place, where women attack their brazen sisters from the margins, discouraging them from “painting women in a bad light”, or some such. Or they could always latch onto the tried-and-true method of “fixing” the problem by attacking men as insecure pigs. So, what do my readers think of this matter? Will women “price themselves out of the market” faster than male desperation can compensate for? And how will women on the margins react to more and more men becoming aware of the con that is being pulled on them? and those who rise early to seek him will find favor. and an insolent and proud man will not cower in fear. There are several gems of wisdom here that I found important. While straightforward, the first verse is difficult to accept. None of us likes to be disciplined (at least, I don’t- I suppose others could). Indeed, we often go to great lengths to avoid punishment. I suspect that the acceptance of discipline, of both acknowledging wrong and acquiescing to measures meant to correct it, is necessary to keep the faith. Without that acceptance, we will never really understand that actions have consequences, an understanding without which we can never appreciate the sacrifice of the Cross. Verse 17 also spoke to me. In fact, it reminded me of those who “Church Shop.” If they are in a church that doesn’t suit their fancy because it happens to tell them that their ways, then they will go elsewhere. Eventually they will find a “church” which gives them a decisions to their liking. 15 “‘I know your works: you are neither cold nor hot. Would that you were cold or hot! 16 So, because you are lukewarm, and neither cold nor hot, I will spew you out of my mouth. As Christians, we cannot be lukewarm. We cannot stand on the sidelines in this world. Neutrality is not an option as a Christian, we must choose to act, and to act decisively. Sometimes that can be pretty difficult, as it isn’t always clear what the right option is. Sometimes it seems like we don’t have a choice. But we do- they may be unpleasant choices, but they are there for us to make. And verse 16 from Sirach above reminds us that those who truly fear the Lord will make righteous judgments- we will be able to tell light from darkness if we give ourselves completely over to God. 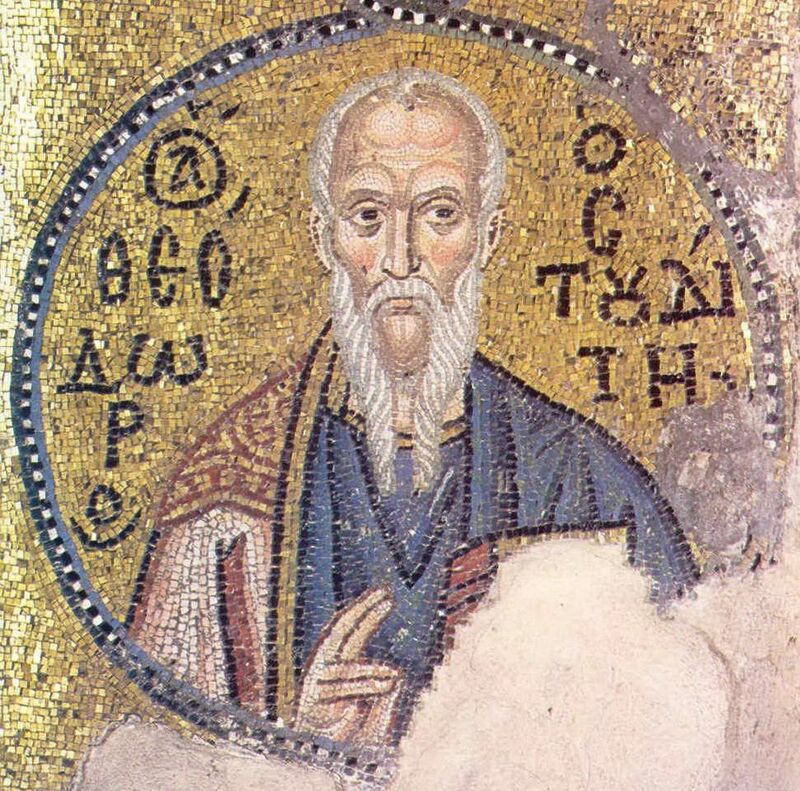 Theodore the Studite (also known as Theodorus Studita, St. Theodore of Stoudios, and St. Theodore of Studium; 759–826) was a Byzantine Greek monk and abbot of the Stoudios monastery in Constantinople. Theodore’s letter, containing suggested monastery reform rules, is the first recorded stand against slavery. He played a major role in the revivals both of Byzantine monasticism and of classical literary genres in Byzantium. He is known as a zealous opponent of iconoclasm, one of several conflicts that set him at odds with both emperor and patriarch. I first found out about Saint Theodore when I was looking at his contemporary Tarasios, Patriarch of Constantinople. What impressed me about Saint Theodore, and soured me to Tarasios, was the Moechian controversy and how each man responded to it. For those unfamiliar to that bit of history (like I was), here is what happened: The Eastern Emperor, Constantine VI, decided to divorce his wife (and send her off to a convent) and marry his mistress, who happened to be his wife’s lady-in-waiting. The Patriarch of Constantinople, Tarasios, didn’t speak up against this adulterous union. Theodore, on the other hand, did. Theodore demanded the excommunication of the priest who officiated the “wedding”, along with those who received communion from him (which would have included the emperor). After declining an offer from Constantine to make peace (which didn’t include Constantine repenting of his sin), Theodore was seized by imperial troops, flogged and banished. Reading about that time made me realize how much we need spiritual leaders like Theodore in the Church right now. For Catholics, someone of that stature is needed to decry the abuse of annulments, which have basically become divorces in the Catholic Church. And Protestants could surely use someone willing to call out abuses of their own standards of marriage and divorce. Here is a question that I think we all should ask: how many Christian leaders do you know in the West who would be willing to face torture and banishment for speaking out against the rampant adultery and desecration of marriage that occurs daily? The number, whatever it is, is not enough. To all of those who still think that Family Law in America has any traces of justice left in it, read this. Read the whole thing. As far as I can gleam from the article, the father in question has defied no court orders. Nor did he fail to meet some prearranged deadline or statutory requirement. He merely didn’t do something the judge feels would have been convenient. And that is enough for him to potentially (probably?) lose his daughter.